Yeah, here is my finished pic of the Chatelaine Mystery IX tryout piece. It really is beautiful. I wish you could see the beading better. It really is sparkly. Cooper gives it his meow of approval. Now i am off to hopefully get some good work in on my garden exchange for SBEBB. Very pretty!! Can´t wait to start Mystery IX :-)!! The tryout is so pretty! Only a few more days now until we start! Yay! This is beautiful! 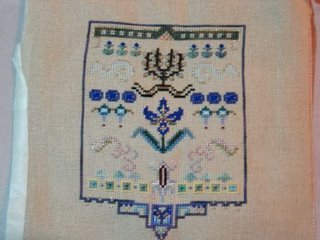 You have inspired me to start this sampler, too. I only hope I can catch up! Where do you hear about the round robin groups? I would love to join one. I used to live in Northern Va. Just moved to Baltimore in November. I lived in Ashburn. Have you ever been to The Scarlet Thread in Vienna? They have a nice shop. Email me if you want, at mindigayle71@yahoo.com. I would love to be a part of your next round robin.